Wonderful Deb Diesen of "Pout Pout Fish" fame shares a loving vignette of a little girl and her grandfather strolling through the woods on a brilliant fall day. Not only do they greet a woolly caterpillar, a flock of geese, and soft autumn chrysanthemums, but they honor all that the season offers as they reveal their pleasure in each other's company. A landscape rich with the voices of nature, companionship, and just the right pumpkin make for a happy day. A grandfather and his granddaughter welcome fall in this sweet, whimsical story about finding beauty and wonder in every moment. Fall is here! Colorful leaves whisper to each other. Geese honk as they flock across the sky. Pumpkins listen patiently from their patch. The season announces itself in all sorts of ways—if you stop to say hello! 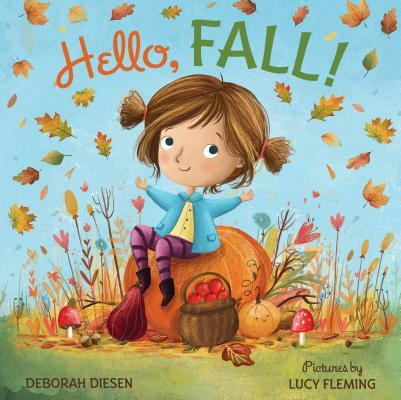 From New York Times–bestselling author Deborah Diesen and illustrator Lucy Fleming, Hello, Fall! is a touching story of the autumn season. Lucy Fleming lives and works in a small town in England with an animator and a little black cat. She has been an avid doodler and bookworm since early childhood, drawing everyday, bringing characters and stories to life. When not at her desk, Lucy loves to be outdoors in the sunshine with a hot cup of tea—doodling, of course. She is the illustrator of Hello, Fall!, written by Deborah Diesen.